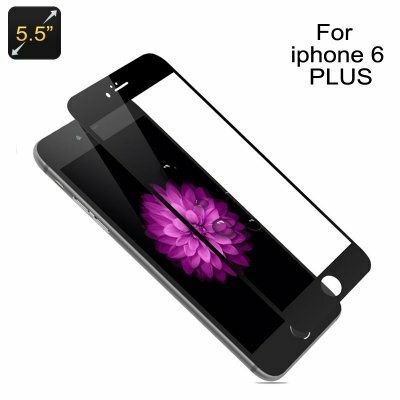 Successfully Added Tempered Glass for iPhone 6 Plus - H9 Hardness, 0.3mm, Washable, Scratch Proof (Black Frame) to your Shopping Cart. iPhone 6 Plus and iPhone 6S Plus are models designed specifically for those who appreciate a good screen on a smartphone. Coming with a 5.5 inch Retina HD display, iPhone 6 Plus and 6S Plus are a work of art in their own right. Now, think how you would feel if your phone’s perfect screen was accidentally damaged? A simple scratch or drop may do the trick, leaving you with a huge bill for screen repairs or even the need for a new phone. Forget about Apple Care,that's just way to overpriced insurance. All you need to do to avoid the unpleasant situation is get the right screen protector that will serve you and your phone well. This tempered glass screen protector has been created specifically for your iPhone 6 Plus and comes with 9H Hardness Rating (scratchproof even against hard and sharp objects), shatter-resistance (won’t break into pieces on impact) and ultrathin design (0.3 mm). The screen protector will fit nicely onto your phone’s screen, preserving its clear visibility and full touch-sensitivity. You miss the classic black color of previous iPhone models? This protector comes with a classy looking black frame that can replace the looks of your current iPhone 6 color..